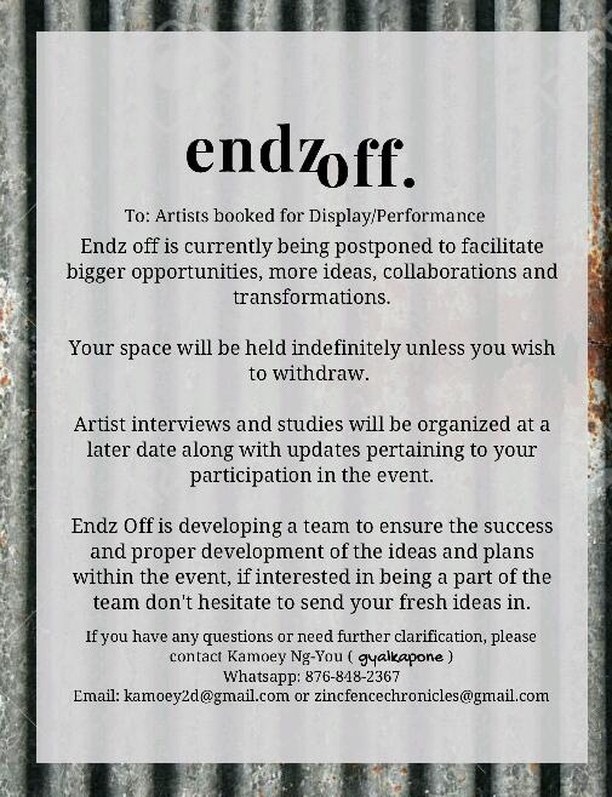 Jamaican Creative @Aurora_NG_U Hosts “Endz Off” Creative Mixer Event! Update 1: “Endz Off” postponed until further notice! The ability to create is such a beautiful thing, and the Island of Jamaica boasts a plethora of Creatives that help to elevate the Culture in Music, Fashion, Literature, and Art. Unfortunately, not many Creatives are being recognized as physical platforms for them to display their work are in short supply. Enter Kamoey Ng-You a.k.a. “GyalKapone“, a fellow Creative who hopes to make a change and start something new with her Creative Mixer event called, “Endz Off“! With a September 30th date and being held at Chaser’s Cafe (5 Belmont Rd., Kingston), Ng-You invites DJs, Writers, Musicians, Artists, Photographers, and Designers to attend and display their works of art to a new audience which can in turn create Business opportunities, make new connections, and growth in their careers. When asked the reason for the event, Ng-You said, “I want to give all mediums a chance to just be comfortable in a non-competitive environment, because for young Artists in this Country, everything is a “Fight to the top”. While some competition is healthy, it’s not always the best because a lot of us suffer from issues that our Art gives us refuge from“. While the Event is free to attend and Creatives showcase their works for free, Ng-You hopes to get the attention and assistance of Corporate Jamaica, and encourages attendees to support by purchasing pieces from a Creative. “I’m trying to invite as much people to participate as possible, even if I have to pay for their work to be printed and mounted out of pocket because people need fi buss, and I’ll be damned if I don’t make that happen because I know I wish someone would help me” she added. Creatives participating in the Mixer are requested to bring a copy of their favourite piece of work that they’re willing to part with as a giveaway session may arise during the event. “I want everyone to leave with someone else’s favorite artwork because that energy and positivity is channeled to others. Sharing the things that make you happy with someone else is one of the greatest things you could ever do and I want to promote that movement. I want everyone to have a smile on their face at the end of the day” said an exuberant Ng-You. She closed by saying, “It’s not about money, it’s not about hype, it’s not about a bagga chatting. It’s about giving everybody a platform to be themselves, be comfortable and make a future“. The “Endz Off” Creative Mixer will start at 5PM, and ends at 8PM. To participate, contact Kamoey Ng-You at 848-2367, or send her a Direct Message on Instagram at @GyalKapone. Aiming to break out of the monotony today is singer Davianah with her latest single. Titled “Music Madness” and produced by Mark “Genaral” Thompson for Thompson House Music, Davianah gets at artists who fail to bring more positive subject matter to their audience and break out of the continuous stream of sexually charged lyrics being played on the airwaves. She also warns that the youths are listening to them and they are not setting a great example for them to follow. Davianah delivers on this one as this is a song you should keenly listen to. While it is true many of us listen and enjoy the sexually charged lyrics, at times we must make room for more positive lyrics and guide the youth along the way. Don’t turn the music to madness. Check out the track below and share your thoughts in the comments section. Now here is something appealing to the eyes! Top Jamaican Illustrator Taj Francis recently collaborated with Reggae acts Protoje and Chronixx, and Producer Winta James to craft an Audio-Visual EP titled “TENFOLD:Opus“. The EP is a collection of Audio-Visual pieces that interprets the works of the Musician, Producer and Artist. Titled “Who Knows Dub“, this piece was inspired by the duality of inner peace and anxiety. If you’re not familiar with Taj Francis, he is the person behind the artwork for Protoje’s albums, Green Lion Crew’s “Rough Road”, and many more. It’s always refreshing to see art like this on display and this is something that you watch over and over. Check out the video below and share your thoughts in the comments section. Can you guess who that is? Hey bloggers, thanks for being here again for another blog post. Today’s art feature comes from artist, crazy person and fellow blogger Latoya Gail. Hailing from St. Ann, Jamaica she does a little bit of everything from painting to photography. Currently residing in the United States, she brings her emotions and ideas to her work. Check out more of her work below and share your thoughts in the comments section.